Our team has been working hard to make things easier for you. We have previously discussed our new sign in-out and billing functionality, but now we will cover our amazing new daily activity and parent engagement features! Our goal with these new features is to strengthen the bond daycare providers have with the parents and the bond between parents and their children. We have already received great feedback and will continue to add more! Engage with parents through daily activities updates. Send messages, notifications, and alerts directly to parents via email, text, and push notifications. Parents have the ability to customize which notifications they want to receive in the settings of their app. Engage with Parents through Daily Activities. Add photos & videos of all the fun their child is having while they are at work. Help parents continue to build a bond with their child throughout the day, leading to more engaging questions when they come to pick them up. You can also capture and send incident reports about minor injuries or behavioral issues. You can record any medications a child may need and when you gave it to them. 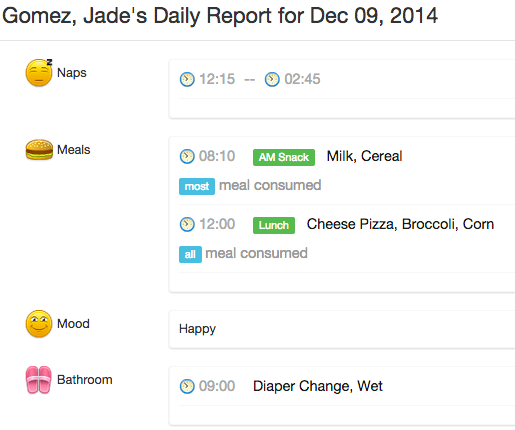 Naps, meals, mood and bathroom breaks can also be recorded to ensure all daily activity records are up to date. And, if you choose not to record an activity — that’s fine too! Parents will only receive what you choose to record. Send messages directly to one or many parents at once. It will go out as an email and push notification, but you also have the option of sending as an SMS text message to ensure they open it (who doesn’t open their texts?). This is a great tool if you need to send an alert to parents or if there should ever be an emergency. The school bus could break down on a field trip, there could be a lockdown drill at the school, whatever it may be — this can help ease parents’ minds and let them know their children are okay. Now you can track what your students learned throughout the day! You have the option of sending these activities directly to parents or to keep their progress internal. Engage with your parents even more! We have added emojis to better address the mood of the children to their parents. Check out this story of how emojis changed Laura’s Daycare. Request a live FREE demo here! You will find all your reports in one dashboard. Most recent downloads will be available in a queue for quick access. This includes a daily activities summary report, meal tracking report, and student & family data available for download anytime. Join Kinderlime today and discover how you can manage your billing better, online! Try a FREE 30-day Trial! 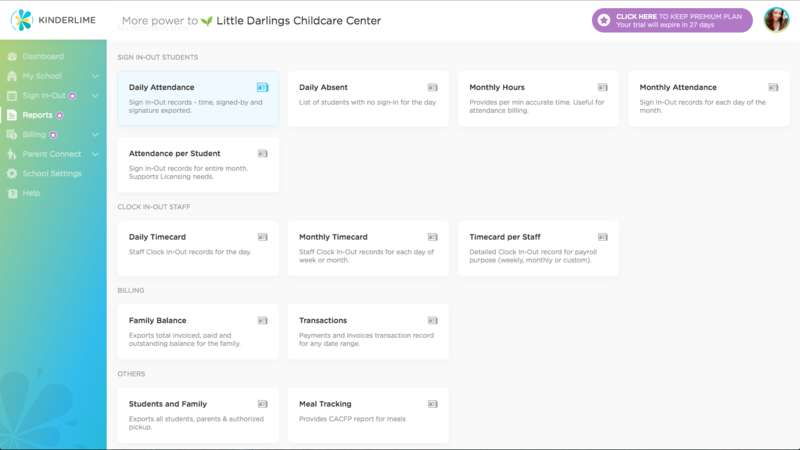 The ultimate timesaving software for daycare and afterschool.